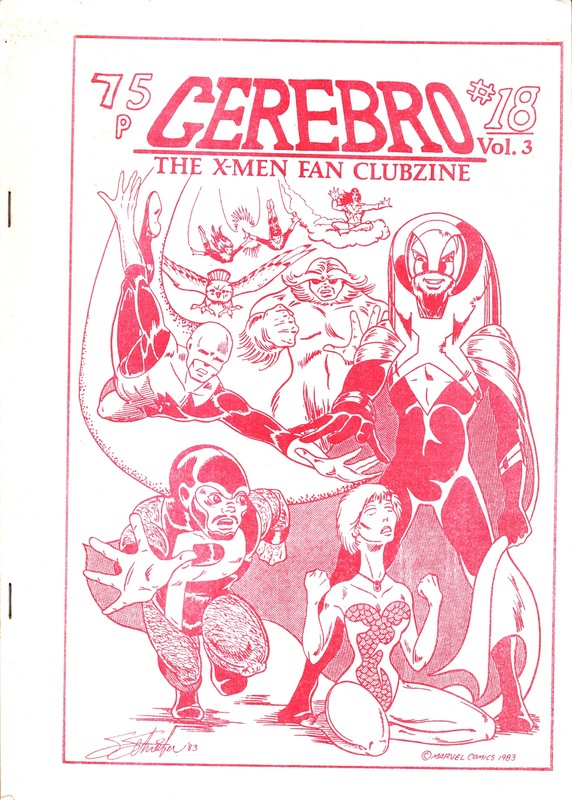 This is CEREBRO, the newsletter of Britain's X-MEN FAN CLUB. I don't know much about the history of this club, or its newsletter, so I thought I'd run this to see if it stirs any memories. Run by Geoff Lampey (whom - I have an idea - may have also gone under another name, although I can't recall why I think that), the newsletter was a substantial affair dedicated to the various incarnations of the X-Men themselves, as well as the spin-off titles (such as ALPHA FLIGHT, above) and the various solo projects of the X-members. I was never a member, but I did pick up a few back issues of the newsletter from Bristol's FOREVER PEOPLE comic book store sometime in the eighties. Over the years, I misplaced those issues (I distinctly remember an "X-Ducks cover, spoofing the iconic Giant-Sized X-Men 1) but somehow acquired the one pictured above. I'd love to get my grasping fan-boy hands on more. I remember Cerebro very well. I was an early member of the club, and a frequent contributor to the fanzine. As you say, Geoff was the guy who ran it. I believe he started it in the late 70's/early 80's, and it ran for about 25 issues. Unfortunately, the gap between issues grew longer and longer, for lack of time and funds (Although members paid something like £3.50 for 6 issues, this fell some way short of the actual cost), and this probably ultimately killed it off because there was no shortage of enthusiasm or contributions from numerous members. One of Geoff's main aims was to give encouragement and advice to contributors of art and features, so they could develop their skills. This meant that he'd often print some pretty dodgy artwork etc and then you'd find the self-same contributors, improving quite quickly thereafter. Cerebro did actually have some fans who went on to become comic book pros. Whether that was down to Geoff, only they would know. Hi.. I have some for sale or trade if you are interested?